"...the rate of remissions was 81.5% to 100% (P < 0.003)." 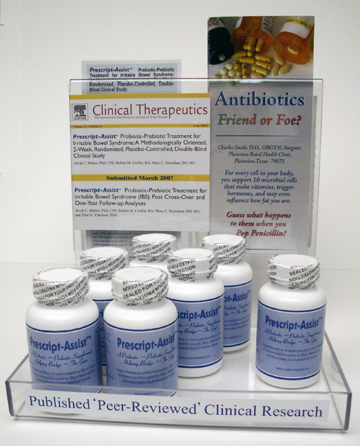 All clinical studies have been conducted with treatment doses of two capsules per day. Further, as referenced below to herbal or plant nutrients, the effectiveness of any nutritional supplementation (vitamins, minerals, amino acids, phyto-nutrients, herbs, etc.) will be limited by the nature and extent of the gut's microbiota. "An herbal, or plant nutrients' benefit may be seriously compromised or rendered non-existent, considering that absent proper intestinal microbiota there is a decreased therapeutic effect of some medicinal herbs and phytoestrogen-rich foods" (1). "The activity of many medicinal herbs depends on bacterial enzymatic metabolism in the colon. Of the many enzymes produced by intestinal flora, bacterial beta-glycosidases probably play the most significant role, as many active herbal constituents are glycosides and are inert until the active aglycone is released via enzymatic hydrolysis" (2). 1. Kilkkinen A, Pietinen P, Klaukka T, et al. Use of oral antimicrobials decreases serum enterolactone concentration. Am J Epidemiology 2002;155:472-477. 2. Pengally A. The Constituents of Medicinal Plants, 2nd ed. Crows Nest, Australia: Allen & Unwin; 2004:43-58. Functions of digestion, assimilation and elimination are altered by antibiotics, as well as a host of other prescription and non-prescription medications. Lifestyle, stress, food and beverage consumption, along with environmental exposures to various chlorinated hydrocarbons, etc. play a significant role in affecting the gut's microbiota, and therefore its proper function; thus, a person's Quality of Life. Prescript-Assist® -- unlike other formula -- was specifically developed with these factors, and more, in mind. Among other of its attributes, it has been designed to help detoxify harmful environmental phenols and biphenyl chemical compounds. It embodies properties supportive of being a natural chelator and powerful anti-oxidant; both helping to preclude free-radical damage. It eliminates causative factors of intestinal toxemia, while detoxifying chemicals associated with the incomplete digestion of proteins - indole, skatole and phenol. Its anti-inflammatory properties sooth and calm the gut, while normalizing the resident microbiota; thus bringing relief from intestinal bloating, cramping, constipation and diarrhea. P-A is 'Patent Pending' for numerous treatment applications, to include "Travelers' Diarrhea" as it demonstrates broad efficacy for controlling food and water borne pathogens of bacterial, viral, fungal and parasitic origin.